Curling Stones for Lego People: What's on my Wrist? If you follow me on Instagram you might have seen this one yesterday! 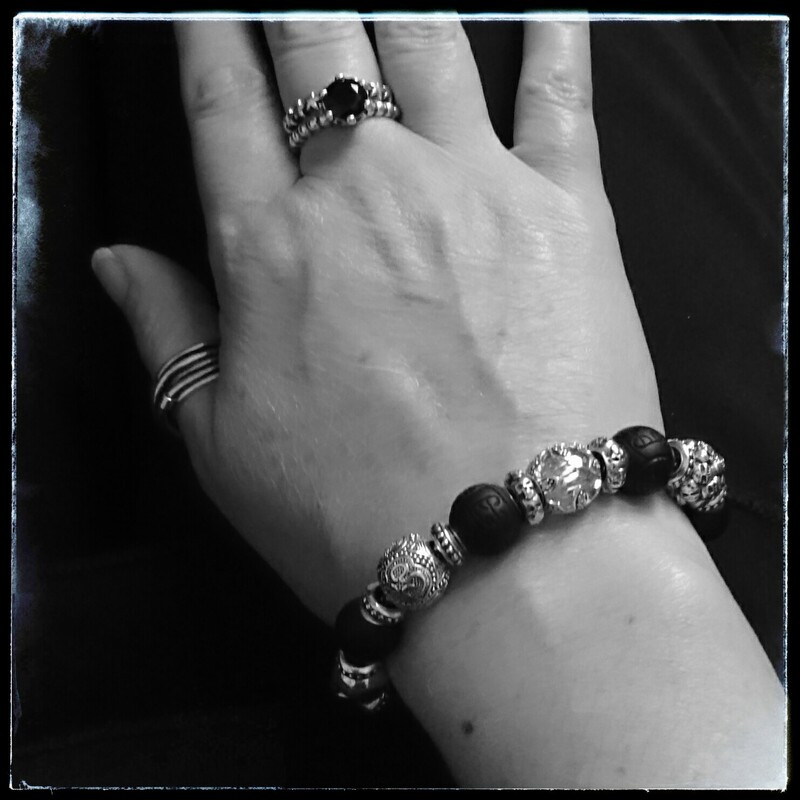 I dusted off my Thomas Sabo Karma bracelet, or more accurately the jewellery box it was in, and paired it with my new Pandora rings from my shopping trip last month! I rarely blog Instagram photos just by themselves, as that's what Instagram is for... but I think this one deserved an entry of it's own! Hi Mars - sorry I've been taking a break but it's nice to catch up and so pleased I can remember you posting about your fabric jewellery boxes! I followed your link to take a closer look at your bracelet and thought how lovely it looked and even better you'd designed it yourself :) Well worth a photo and a post! I'm normally not quite as co-ordinated with my bracelets & rings - but I thought these 2 were so well matched it deserved a quick post! Looking back at the Karma bracelet I thought I would have indulged in the next round of 3-6 coloured beads to change the look... but I'm still happy with my black & silver! Absolutely worth a post--such lovely creations! Good luck with the writing, thoroughly enjoyed Travellers so will check out your other titles. Born in 1976, I retired 15 years ago. What am I?